My love of making stuff, isn't limited to fabric, paper, and yarn. I like going to the hardware store, and I even have my own cordless drill. So, since our 5 year old computer hasn't been doing too well for the last few months, I figured it was time for a new one. With a lot of help from my genius brother, who picked out all the components on TigerDirect.com and then spent 90 minutes straight on the phone with me, downloaded the mainboard manual onto his own computer, and told me where to plug in all the tiny little cables, I built a fancy, schmancy new computer for about half the price a new one with all the same specs would have cost. Yes, my arm is very sore from patting myself on the back. The husband then loaded all the memory-hogging, processor-using, super graphics-type games he could find on the thing, and it works great! It's nice and fast, and while the insides may not be too pretty, all those cables and circuit boards are neatly housed in a slick, silver case. 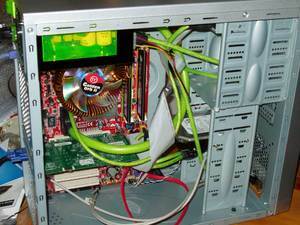 I don't know if there are super geeks out there reading my blog, but this is what we've got: Intel Dual 2 Core 2.6 ghz processor, 2x1024 GB memory (RAM), a 320 GB hard drive and a GeForce 7300 graphics card with 512 MB memory. Also, the fan glows blue and the power box glows green, both of which serve no purpose other than looking very cool. And now, my brain is very tired from this exertion. I spent yesterday afternoon watching TV for many hours to recover.